Today's guest post is by Mrs. Shirley Wood. Shirley was born and raised in West Virginia up until the age of 12 when she and her family moved to Ohio. She is a published author of stories from her childhood. She now lives on a small hobby farm in northeast Ohio. I hope you enjoy her story as much as I did! 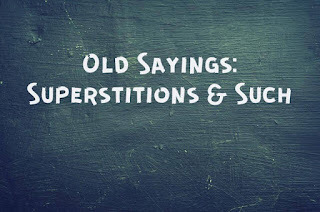 Parents love to quote old sayings, and like all children, we questioned whether or not they were true. I’m not talking about the usual “Don’t run with scissors” or “You’ll put your eye out with that stick”, I surely wanted to keep both of my eyes. But there were a lot of others that made no sense to me then, and some of them even less now. You’ll see what I mean. There were a lot of sayings about food, such as “Don’t ever eat fish and drink milk at the same meal”. Maybe someone died once before refrigerators were invented, after eating those two items, one or both of which may have been spoiled. Or it could have been something he ate the day before that killed him, or an infection or appendicitis. Maybe he drank all the darn milk and his survivors blamed it on the milk he drank with the fish, silently glad he didn’t leave any for them. Mama also warned us not to follow each bite of food with a drink of water during meals. Otherwise, we would end up with a swallowing disorder, for which the treatment was to swallow a string that reached all the way down to our stomachs. At first I was afraid to try it, but after that first time, I felt compelled to take a drink of water after each and every bite of food for years afterward. There was an interesting challenge that involved boiling an egg, cutting it in half, removing the yellow, and filling the holes with salt. If you ate the egg with the salt before going to bed, you were supposed to dream of the one you would eventually marry. My sister Eva tried this, and nearly choked to death. She does not remember who she dreamed of that night, but accused Daddy of trying to kill her. Probably everyone has heard the old one about putting someone’s fingers in a bowl of warm water while they are sleeping, and making them pee the bed. That one didn’t get too much play at our house, because all three of us girls slept in the same bed. As the littlest, I always got stuck in the middle, and would have gotten it from either side. Snakes and cucumbers were the subjects of quite a few stories. When planting or tending cucumbers in our garden, if a woman was in her monthly cycle, she was not permitted in the cucumber patch because it was said that the blooms would all fall off. We never knew for sure, and would not have wanted to find out. Another story that I’ve heard many times is that just before a rattlesnake strikes, you smell a strong odor of cucumbers. I don’t know anyone who can verify that story, and don’t want to test it for myself. One story about snakes, with which I do have some experience, is that no matter what time or how they are killed, snakes do not die until sundown. Having witnessed the death of many snakes, and taken part in several, I can assure you that no matter how many pieces a snake is cut into, each of those pieces keeps on wiggling for hours afterward. Is the snake alive or is it only nerves reacting? I don’t know, but it certainly is creepy. When we were growing up, if any barbering was done in our home, whether on an adult or child, the hair had to be disposed of by burying, and a rock placed atop the buried hair. It could not be burnt or otherwise left in a place where birds or other varmints could make off with it, otherwise the unfortunate individual to whom the hair belonged would suffer from a headache that would last the rest of his or her life. I guess people took it pretty seriously, because I never met an individual that complained of headache every day. However, there might be a few husbands that disagree. There were some predictors of weather that we were all familiar with, such as a ring around the moon foretelling rain. My husband had a good laugh at my expense the first few times I predicted rain because all the leaves in our neighborhood were turning up, but has since accepted that it is at least as accurate as the weather forecast on TV. We don’t live around too many cows, but sometimes on an outing when I see cows lying down I remember that is also a pretty reliable sign of rain. In a herd of five cows with two of them are lying down, I will drill it down even further and say there’s a 40% chance of rain – again, at least as accurate as the TV weatherman. 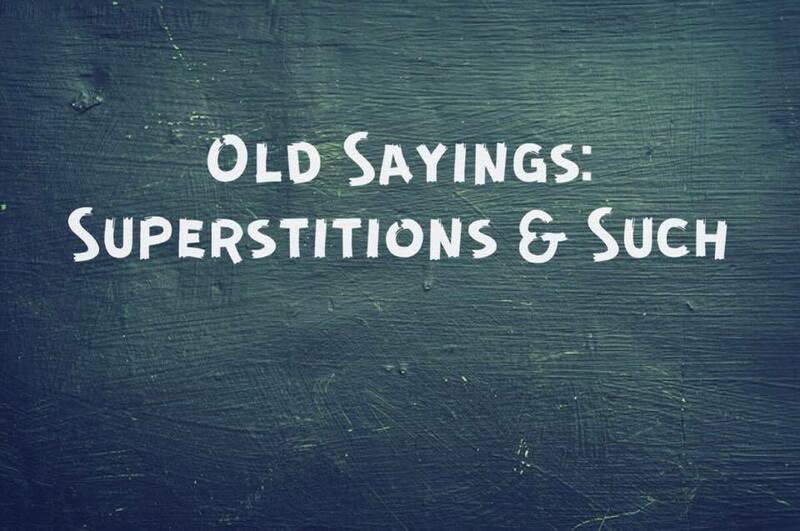 There were a lot of old sayings that seemed to be based in religion. You could wear red anytime and anywhere, but only women of loose morals wore red shoes, or wore red to church. Neither of my older sisters has ever owned a pair of red shoes. I did and wore them completely out. Women who were expecting when we were growing up were constantly warned not to look upon anything unusual, scary or horrible because they would “mark” the baby, and this never made any sense to me at the time. Whether or not it is true, there is some biblical background in Genesis 30, when Jacob “marked” cattle at conception. We were all familiar with the old saying “A whistling woman and a crowing hen are neither good for God nor men”, and in our family that meant when a hen started to crow, she ended up in the pot with dumplings pretty quickly. Thankfully, the whistling part was pretty much ignored, because I have always loved to whistle, and anyone who ever heard me sing is pretty glad of that. For some reason women were never supposed to sew on Sunday. My mother loved to sew, and made beautiful quilts almost until the day she died a couple of years ago. Sometimes when she was caught up in a beautiful quilt, she would sew on Sunday, but I could tell she felt guilty about it. There are some who say it is work, and therefore should not be done on Sunday, but for Mama it was pleasure to sew, and it kept her active mentally as well as physically. And those same individuals who might have criticized her would not have blinked if, on Sunday morning, the old hen started crowing and had to be killed, plucked, and cooked! There was one saying of my dad’s that we heard pretty often, and found out that he was never wrong. Like most children who are close in age, we sometimes picked on one another. We would start out tickling, pinching and laughing, and we could get pretty loud, especially if we were inside the house. When the noise began to get out of hand, we would hear Daddy say “That laughing is going to turn to crying in about five minutes”. Sure enough, if we continued on in the same course of action, we could count on it.